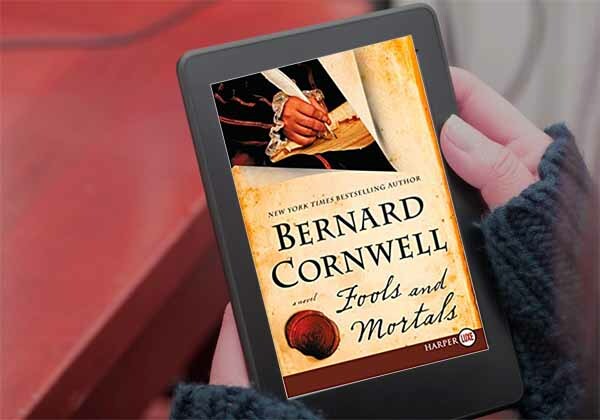 FOOLS AND MORTALS by Bernard Cornwell sets the standard for historical fiction with a touch of suspense and a healthy dose of Shakespeare. But before I gush about how good the book is, let me say that Cornwell is one of my favorite authors. First, in 2014 when I wrote a blog series on bookstores vs ebooks, he took the time to answer my email. Second, he’s the author of the Richard Sharpe series. Apart from being some of the best historical fiction EVER, the Sharpe books were turned into a miniseries starring Sean Bean. We actually have the DVDs (still) and the board game. The narrator of FOOLS AND MORTALS is Shakespeare, but not the one you’re thinking of. Richard Shakespeare is William’s younger brother, a crafty and likeable neer-do-well who wormed his way into Will’s acting troupe and steals when he can. He’s young and good looking. Typically cast as a woman, given that only men were allowed to be actors in Elizabethan time, he demands that Will cast him as a man and up his salary. But Will has little time for the wild Richard. The Shakespeares and their royal patron are caught up in a bitter rivalry with another playhouse which similarly enjoys a royal patron. Good plays are the ammunition that fuel the war but they are few and far in between. There is no copyright protection, moreover; whoever has the manuscript puts on the play. Fresh material means big income and Will’s new play, written for a wedding the queen herself may attend, is A Midsummer Night’s Dream. Until the handwritten manuscript is stolen. Cornwell masterfully uses the political upheaval caused by Elizabeth’s ascension to the throne and resulting purge of Catholicism in England to drive suspense. Not only does he offer the minute details of Elizabethan England such as dress, habit, and food, but London has never been so noisy, so gritty, so perfectly captured. Maybe I’m partial to the book because A Midsummer Night’s Dream features in a nightmare sequence in my suspense novel AWAKENING MACBETH. Also, I played Tatiana in a high school production of A Midsummer Night’s Dream. But that’s only one more reason to enjoy the historical suspense of FOOLS AND MORTALS. Loved the book. Heard about it in a writing class. Great review. Bernard Cornwell is also one of my favorite authors. Although I never read the Sharpe books, I have read all of the Saxon novels. I don’t know how he does it. Apart from his vast research, he must write all the time. It’s not just a hobby; writing is his life. Thanks for this review, Carmen. Cornwell is one of my favorite authors and I have read the entire Sharpe series. Looking forward to reading the book as well. Insightful review!